So, Ya Wanna Be A Pirate? 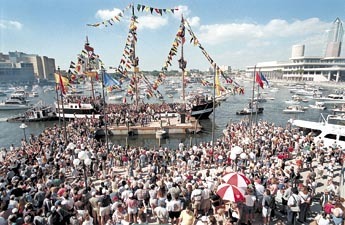 This year marks the 107th Gasparilla celebration. In case you’ve never heard of this signature festival, it’s like Tampa’s version of Mardi Gras (which is to say the organizers have been desperate to have people call it “Tampa’s version of Mardi Gras” ever since they began calling it that). The comparison’s are staggering. It’s a parade where people get drunk and throw beads. See, staggering. "Arrggh, mateys. Hoist ye beads." To be fair though, it’s all bogus. Depending on where you do your research, Jose Gaspar (the titular pirate of the event) was never even know to patrol the waters in and around Tampa Bay and that’s if he ever even existed at all. Gasparilla was begun more a less as a publicity stunt designed to bring some attention (and money) to Tampa. Technically, Gasparilla doesn’t even belong to the city, it’s the domain of Ye Mystic Krewe. This is a collective of the city’s “finest” (you know politicians, lawyers, trust-fund babies, and other self-important entitled types). Each year these middle-aged men slather on the makeup (think ‘dirt’ and ‘scars’), tie do-rags around their receding hairlines, have their girth ensconced in silken puffy shirts, kiss their trophy wives goodbye and revel in the cheers of a city while trying to get drunk coeds to take off their tops. All was well and good with the festival until it hit snag in 1991. The Super Bowl was being played in Tampa that year and Gasparilla was scheduled the day before the big game. With the national media descending on the town, the Krewe wanted the exposure and recognition it would bring. And boy did they get it. The Krewe was pilloried for not allowing minorities or women in their ranks (and I know what you’re thinking, that is really out of character for old wealthy, mostly Republican, white guys). But, rather than correct this embarrassing policy and attempt to enter into a post-Civil War mindset, they cancelled the festival in a pouty huff. In its place, Bamboleo was born (rather, still-born).The following year, the Krewe happily (no, those aren’t gritted teeth, those are smiles) accepted enough minorities to appease people and Gasparilla was back on. (Women were still banned, but come on, if they start allowing women next thing they’ll have to let their wives in and who wants that?) A lot of other Krewe’s began popping up throughout the 90’s and the parade expanded exponentially as the Krewe (sometimes reluctantly) allowed them into their little party. The wacky antics of the Ye Old Creepy White Guy Krewe aside, Gasparilla truly is a fun day. If you’ve never been and you’re not easily offended by public drunkenness (and occasionally, urination) and enjoy mostly good-natured revelry, I suggest you attend. Here are some tips to remember as you blend with the 400,000 in attendance. Well, 400,001 actually, I forgot to count myself. 1. Leave the kids at home – A few years back the created a kids parade on a separate day specifically because this had become a lousy environment for children. Seriously, this is not for them. Nothing dampens a nice day of drunken debauchery like little ones running between our legs. Plus, they slow you down and make a bad bathroom situation that much worse. 3. Pace yourself – If you do it right, Gasparilla is a 8 – 12 hour day. You want to get out there by 10 or 11AM to park and get settled. The parade begins around 2PM and after it ends, around 6, you can head downtown for the concerts or, even better, end up at the Hub. (Best. Bar. Ever.) Which means you need to be able to hang that long and be mobile. Don’t be the guy or girl that everyone has to carry around as the day drags on (or drag around as the day carries on, depending on how much your friends like you). 4. I hope you like walking – It’s theoretically possible not to travel several miles during the course of the day, but unlikely. And not nearly as fun. First you have to park, often far from the action. Then you’ll want to travel the parade route to find “your spot.” If all goes well, you’ll meet up with other friends or make new ones and travel with them to exciting destinations (bars). You want to take it all in so hit Bayshore, then go downtown, shoot over to Harbor Island. Do it right. 5. Backpacks are your friend – The “man” may have banned coolers, but you’ll need to have your provisions. So get a nice hiking backpack and load it up with your liquid refreshments, some snack foods, and cups to work around the container laws (also, if you’re traveling with some ladies, you might want to pack a roll of toilet paper, trust me). That’s all it really takes for a fun and exhausting Gasparilla experience. Have fun, stay out of trouble, grab some beads and I’ll see you at the Hub around midnight.